Pontius Pilate (/ˌpɒn[invalid input: '(t)']ʃəs ˈpaɪlət/ or /ˌpɒnti.əs ˈpaɪlət/; Latin: Pontius Pīlātus, Greek: Πόντιος Πιλάτος, Pontios Pīlātos) was the governor of the Roman province of Judaea from AD 26 until 36. He was the sixth Procurator of Judaea. In modern times he is best known as the man who presided over the Trial of Jesus and ordered his crucifixion. Tacitus mentions in his Annales (15,44): "Christus, from whom the name had its origin, suffered the extreme penalty during the reign of Tiberius at the hands of one of our procurators, Pontius Pilatus". Philo of Alexandria (Leg. ad Caj. 38) and Flavius Josephus (Antiq. 18:3, 4 and Bell. II:9, 2-4) also mention him. Pilate's biographical details before and after his appointment to Judaea are unknown, but have been supplied by tradition, which include the detail that his wife's name was Procula (she is canonized as a saint in the Greek Orthodox Church). 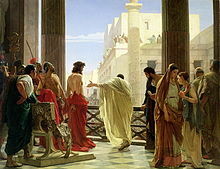 Encyclopaedia Britannica 1911: "Pontius pilate"
↑ Timothy M. Milinovich, ed. (2010). Pronunciation Guide for the Lectionary. Liturgy Training Publications. ↑ "Britannica Online: Pontius Pilate". Britannica.com. Retrieved 21 March 2012. ↑ 7.0 7.1 7.2 Stephen L Harris (1985). Understanding the Bible. Mayfield,Palo Alto. ↑ auctor nominis eius Christus Tibero imperitante per procuratorem Pontium Pilatum supplicio adfectus erat "P. CORNELI TACITI ANNALIVM LIBER QVINTVS DECIMVS". This page was last changed on 2 April 2018, at 12:31.